Its market-leading status is at stake. More than 1.5 billion devices currently use a version of Windows, making it by far the most installed operating system, according to tech research firm Gartner. But investors are more concerned about the firm's growth prospects amidst growing competition for customers' cash. "We think the industry changed with the iPad launch because the tablet is effectively a PC - it doesn't need to be connected to a network to work and runs third-party applications," Steve Brazier, chief executive of research firm Canalys, says. "Once you segment the market that way, Windows share of the global PC market has fallen to 72%. Three years ago that would have been over 95%. "If you add the PC market together to the smartphone market - which we call the intelligent device sector - Windows share falls to 32%." Windows 8 and its close relation Windows Phone 8 are designed to reverse that trend. One thing is certain: Microsoft's efforts will have industry-wide ramifications. A study by Gartner indicates worldwide PC shipments were 8.3% lower than the previous year in the July-to-September quarter. That spells trouble for companies including HP, Dell and Acer which have seen sales decline as a consequence. A successful launch might recharge demand, but first they must face the prospect of a challenge from Microsoft's own tablet, Surface. Raimo Lenschow is Barclays bank's software analyst. He says Microsoft's share price and wider fortunes hang in the balance. In our view, Microsoft needs a successful tablet to prevent an erosion of market share and loss of earnings from its core Windows and Office businesses. The key question on our and most investors' minds right now is how much traction the Windows 8 system and Surface tablet can gain. A success could spark a comeback story for the company, while failure would reinforce concerns about the firm's core products. Microsoft's management has remained fairly reticent about providing forecasts for sales and the expected adoption rate of the products, which is likely due to the fact there could be a wide range of possible outcomes. What's more, for the Windows 8 launch the situation is somewhat different from previous launches, as the strong momentum in the new tablet category from the iPad and Android-powered devices is negatively impacting the PC business, and hence raises questions as to whether previous cycles are still a good indication for the current launch. Given the lack of certainty, we prefer to wait on the sidelines before making any detailed predictions about the product's success. Although the new tablet will likely have meaningful sales right from the start, the addition of a significant hardware product to Microsoft's business model is likely to put pressure on its profit margin. Sarah Rotman Epps is a senior analyst at the market research firm Forrester. She warns that Microsoft risks confusing consumers by offering two flavours of its new operating system. Most consumers don't pay attention to the chipset in their device, but Microsoft's latest update to its Windows operating system forces buyers to confront the trade-offs of chipset choices. 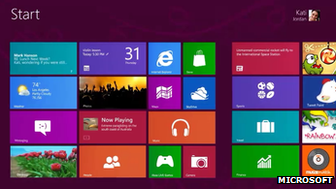 It gets confusing quickly: There are two versions of Windows to choose from, Windows 8 and Windows RT. Windows 8 has two choices of chipsets: x86 (such as Intel Core i5, what your PC is probably running today) and new x86 system-on-a-chip (SoC) designs from Intel and AMD, which function more like the chip in your mobile phone. • Battery life and boot time versus "performance": Windows devices with SoC and ARM chips have the longest battery life and the shortest boot time, but they won't perform as well for intensive computing activities. The Microsoft Surface running Windows RT that I've been testing stutters while playing 1080p video, for example, but Windows 8 tablets running Core i3 or i5 don't have this problem. • Task flexibility: Windows RT does not allow users to do activities like install an alternative browser, install plug-ins (which are required to make many websites work), or access Flash websites unless they are pre-approved by Microsoft. Windows 8 devices let you do anything you would normally do on a PC. While RT devices have longer battery life, many consumers may find the trade-offs in terms of task flexibility too restrictive. Rik Ferguson is director of security research at the anti-virus firm Trend Micro. He thinks Microsoft has made several advances in its new operating system. Microsoft has taken advantage of computer hardware to increase and speed up security in Windows 8. Dedicated computer components can now be used to ensure that malicious code is not loaded as Windows boots up and self-encrypting hard drives take the load off when making your data illegible to snoopers and thieves. The new capabilities are designed to effectively limit the possibility that malicious software is loaded before the operating system. This kind of malware, known as a rootkit, can often bypass or even disable key security functionality and hide its own presence entirely. Windows 8 also provides a means for security software to ensure that it is the first thing that gets loaded when the PC is powered on, in a further effort to stop malware from overriding your protection. When it comes to authenticating users, Microsoft has added some functionality obviously designed for those touchscreen devices it is anticipating. Picture or pin logins can be used once a user's password has been set, as a shortcut to logging in. While this feature may be convenient, research during beta testing has demonstrated some serious weaknesses that could allow an attacker to uncover the actual password of accounts using this feature, so discretion is advised! There are several other features that I don't have the space to detail here, but it's great to see Microsoft continuing to take security seriously and allow specialist security providers to integrate more deeply with its system. Jason Kingsley is chairman of Tiga - the trade association representing the UK's video games industry. He reflects on the controversy caused by Microsoft's decision to launch its own curated app store from which it will take a cut of the sale price. The power of touchscreen computers of all sorts is very impressive and means our creativity as games developers can be unleashed. Is it right therefore that some hardware manufacturers offer shop windows that place limitations on the sort of game that they take? Should Microsoft, for example, only offer products in its Windows that it considers are suitable? In a situation without a monopoly I would say that this is for the market to decide. You can put your carefully crafted game through Microsoft's certification system and have it featured in its shop window, or choose not to take that route and release the game on the same platform in the wild. If Microsoft owns the shop window there is an argument to be made for it deciding what to put in it after all. There are many players who want a curated service, where certain technical and editorial standards are enforced, other users will be just as happy with making their own minds up and taking a risk elsewhere. But while the full Windows 8 system allows choice, the Windows RT version only lets new apps be installed from the store, meaning some games will fall foul of a ban on 18-rated titles. That decision worries some who see Microsoft turning away from its "open platform" roots. What we do know as an industry is that things change very rapidly and that the market is a brutal and unforgiving place. Which approach is the right one for both creators and distributors will be defined simply by the market and people power. Dan Kraemer is co-founder of the Chicago-based design consultancy IA Collaborative. He says the look of the new Windows system marks a significant step forward in computer interfaces. User interface (UI) is one of the most impactful manifestations of human centred design in our modern society. And while it's one of the most progressive spaces for design, I believe it will follow a historic aesthetic sequence. We can think of Windows 8's approach not as a right versus wrong, but as evidence of the progression of a category. Take a look at architectural styles over the ages. One hundred years ago, decorative styles like Victorian and Art Deco prevailed as architecture emerged as "art," much like early web design. In the mid-century Modernists demonstrated "less is more" with nearly no ornamental elements and stark simplicity - think the Google search page prior to all those whimsical banners. At the same time, understanding of architecture elements and new materials emerged. Now we have neo-modernism which embraces a less rigid, more emotive expression of modernist. We might think of Windows 8 as today's neo-modernist interface. Microsoft's rejection of skeuomorphism - the idea that applications need to look like their real-world equivalents - distinguishes it from Apple's OS X whose calendar app features a leather-skinned interface with ripped paper to hint at earlier entries. Apple's design has been attacked by some as being "kitsch", but praised by others for humanising the interface. Windows 8 clearly moves away from this, at least in part - it still uses icons, shapes and colours to identify states which relate to our "real" world. As a designer, I am energised by the fact users are becoming sophisticated enough to handle both kinds of design. Each interface is a unique opportunity to engage and inspire users while progressing the discipline forward. Kirk Schell is the vice president of Dell's consumer products division. 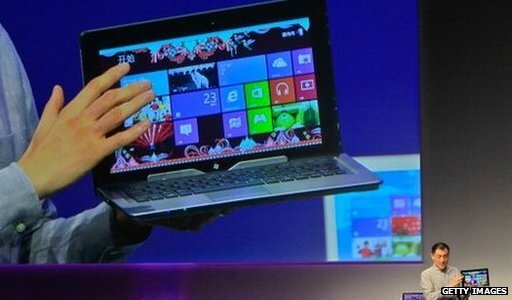 To take advantage of Windows 8's touch interface his firm is releasing a laptop whose screen can swivel in its bezel to lie flat against its keyboard, among other innovative designs. This is an exciting time as it makes people want to look at the different type of computers out there. I see more innovation as companies act to take advantage of the Windows 8 environment, when in a purely price-driven market you would have seen less. Windows 8 is a catalyst to invest more in differentiation. That's a good thing as it will get people out to see what is happening. There is new news. We think that with the launch of computers that they want to touch and which offer other new technologies, that people will look at their old PC and think they at least need to go and look at what's new. This is not just a tablet story. I believe that all consumer-targeted computers will feature touchscreens in less than a decade. At the moment there are manufacturing capacity and cost issues, but the price difference to include the feature will come down to tens of dollars. People like more ways to interact with their device and there will be more cool things to come. I so agree with you petermartyn1. I still prefer XP and I was starting to feel comfortable with Vista when W7 came out, Im using that now, but it still lacks some things that were on XP and Vista. I wont bother with W8, there are too many reports/complaints about the things that are wrong with it.